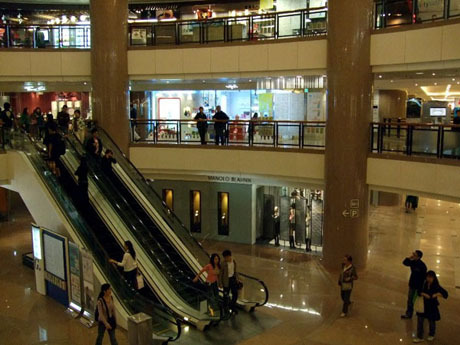 Owned by The Wharf (Holdings) Ltd who are also owners of the Star Ferry and Hong Kong Tramways, Harbour City at Tsim Sha Tsui on the southern Kowloon peninsula is Hong Kong’s largest shopping mall with a floor space of over 2 million square feet. There are over 700 shops, more than 50 food and drink outlets, two supermarkets, three hotels and two cinemas and a major cruise terminal. A 5-storey extension to the mall, expected to be completed by the end of 2017, will have an observation deck on each floor allowing the public a panoramic view of Victoria Harbour. The shopping mall is on five levels running along Canton Road from near the Star Ferry Pier to China Hong Kong City (see below) and ferry terminal. The mall is divided into four zones, Ocean Terminal parallel alongside a cruise ship berth, Ocean City, Gateway Arcade and Marco Polo Hongkong Hotel Arcade. Shops are mainly high-end and mid-range and range of goods includes mens and ladies fashion and accessories, beauty and personal care, childrens and maternity wear, sportswear and shoes, leather goods, shoes and bags, gifts, jewellery and watches, audio visual and electrical appliances and home furnishings. The mall’s flagship store is Lane Crawford Department Store on levels 1 and 2 by the southern entrance near Star Ferry Pier. Lane Crawford also operates a Faces Cosmetics store at its Harbour City location. Ocean Terminal has three themed zones, “kidX” on the ground floor which includes the largest Toys’R Us store in Hong Kong and a Jumpin Gym USA, “sportX” on level 2 which has a large GigaSports store and many other sports and sporting equipment shops and “LcX” on level 3 which is aimed at young fashion. 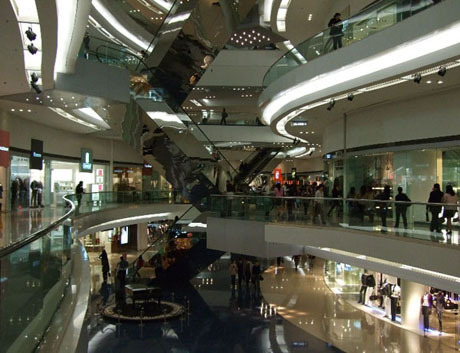 Almost every global fashion retailer has a presence in this mall and major shops include Aquascutum, Bauhaus, Chanel, D&G, French Connection, Hugo Boss, Joyce, Louis Vuitton, Marks & Spencer, Ted Baker, Timberland, Vivienne Westwood and Zara. Café’s and restaurants include four Starbucks outlets, Café de Coral, KFC, Saint’s Alp Teahouse, The Quarterdeck, The Stonegrill, Arirang Korean Restaurant, Golden Bull Vietnamese Restaurant, Iccho Japanese Restaurant, Eastern Palace Chiu Chow Restaurant, Ye Shanghai, Dan Ryan’s Chicago Grill and House of Jasmine. 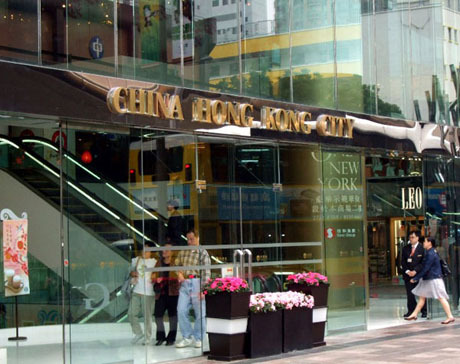 The two supermarkets Wellcome and City’super are located on level 3 of Gateway Arcade and the three hotels Prince Hong Kong, Gateway Hong Kong and Marco Polo Hong Kong are all on Canton Road. Golden Gateway Multiplex cinema is at the northern end of the mall in the Gateway Arcade zone. Shoppers venturing into Harbour City are advised to obtain a shop directory/floor plan on arrival as whilst the layout of this mall appears simple the numbering of floor levels can be particularly confusing when moving between different zones. Online directory of shops and restaurants can be viewed at the Harbour City website. OPENING HOURS – Most shops open every day from 10am or 11am to 8pm, 9pm or 10pm. Refer to individual shops websites (available from Harbour City website above). Café’s and restaurants operate various hours. GETTING THERE – Star Ferry - the south entrance to the mall is about two minutes walk from Star Ferry Pier, Tsim Sha Tsui which is the pier for Star Ferry services to/from Central and Wan Chai. 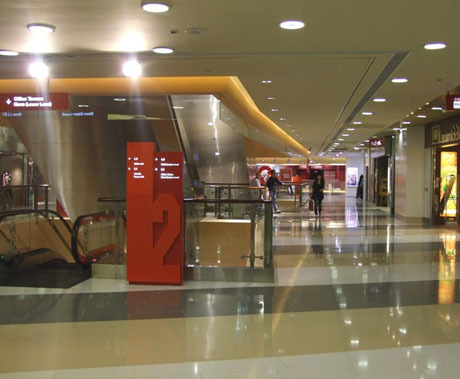 MTR Central Station exit A1 is about 7 minutes walk from Canton Road Gateway Arcade entrance via Haiphong Road. Exits C1 and C2 are about 7 minutes walk from Ocean Centre entrance on Canton Road via Peking Road. BUS – Services 2C,110,215X and 271 via Canton Road pass Harbour City. Services 1,1A,2,5,5A,5C,6A,7,8,9 and 13X terminate at Star Ferry Bus Terminus* which is 2 mins walk from south entrance. Services 8A,26,28,203,208,215X,234X,A21 serve Salisbury Road about 5 minutes walk from mall. With its gold-clad curtain windows and mainland ferry terminal China Hong Kong City is Hong Kong’s self-proclaimed “Golden Gateway to China”. Owned by Sino Group and located adjacent to the northern end of Harbour City Shopping Mall (see above) on Canton Road the complex includes a shopping mall, café’s and restaurants, hotel, five office towers and ferry terminal. 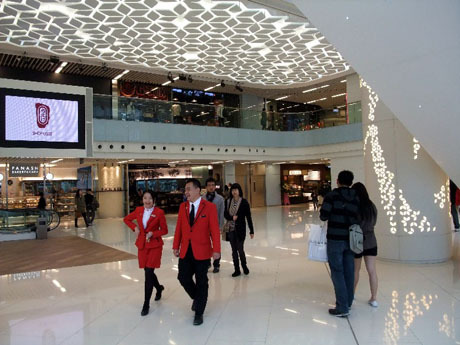 This is not a large shopping mall, mainly designed to attract custom from passengers using the ferry terminal, and shops which are mainly in the medium-low end range are mostly located on the upper ground, first and second floors. During 2010 the mall "re-invented" itself as an "In-Town Outlets" mall and about 20 of the 50 or so shops are discount outlets including Esprit, Baleno, Bossini, G2000, Kappa, Lafuma, Marathon Sports, MaBelle and Tie Rack. Other fashion, ZUME. Other stores sell gold and jewellery, watches, optical, leather goods, shoes and gifts, furniture and household products, beauty and healthcare, audio visual and electrical appliances. The second floor has a Gourmet Express food court with about 12 fast food outlets, there are a further 10 café/restaurants on other levels including KFC, McDonalds, Royal Palace Chinese Restaurant, King Palace (Chiu Chow) Restaurant, Tropical Village Restaurant, Her Thai Restaurant and additionally in the Royal Pacific Hotel & Towers are Café on the Park, Pierside and Satay Inn. There are a number of travel agencies located mainly on level 1. The ferry arrivals hall is on level 2 and departures hall on level 1 and from the terminal fast ferries operate to Macau and mainland China ports including Zhuhai, Shekou, Zhongshan, Shunde and Panyu. At Promenade Level (above the arrivals hall) is Dolphin Square and Pier Observation Deck with views of the ferry piers and over the harbour to Hong Kong Island. OPENING HOURS – The mall is open from 7am to midnight but most shops open 10am to 10pm daily. Café’s and restaurants opening hours vary. See website below for details of individual opening hours. GETTING THERE – MTR Tsim Sha Tsui Station exit A1 (Kowloon Mosque) then walk along Haiphong Road to Canton Road. Walk northwards along Canton Road to China Hong Kong City (about 10 mins walk from station). Alternatively from Tsim Sha Tsui Station exit A1 walk through Kowloon Park towards the “gold towers” of China Hong Kong City. There is a footbridge from Kowloon Park across Kowloon Park Drive/Canton Road to Promenade Level of China Hong Kong City. Take escalators down to shopping mall. Also BUS routes 3C,14,238X to China Ferry Terminal, routes 12,63X,110,215X,281A,296D,973 stop on Canton Road close to the mall. Star Ferry Pier Tsim Sha Tsui is about 15 mins walk from the mall. K11, opened December 2009 is a New World Development Company Ltd development promoted as "the first art mall in the world" and "intertwining the functions of art galleries and shopping malls and pioneers the blend of art, people and nature". The 340,000 sq ft mall is located in the same complex as The Masterpiece, a high-end luxury residential apartment development and the Hyatt Regency Hotel. The mall has six shopping levels with over 100 mostly mid-range shops selling designer fashion, accessories, jewellery and watches, beauty and healthcare products, leather goods, shoes and bags, and lifestyle products. Retailers include Aigle, Samsonite, Chow Tai Fook, Omega, Lens Crafters, D-Mop, Laura Ashley, Fortress, Levis, Miss Sixty, Tiffany & Co, Vica Moda, FILA, Vica Moda, Mademoiselle, Miss Sixty, Barbara Milano and Longchamp, Hush Puppies, Jill Scott, Milan, Clarks, Eric Bompard Paris, Menard and Dymocks Booksellers. There is a Marketplace by Jasons supermarket and Mannings personal store at basement level . There are 22 restaurants, cafe's and food outlets including four restaurants in the Hyatt Regency Hotel. There is a "Gourmet Tower" with a range of restaurants including Japanese, Thai, Chinese, Western and Thai. The mall features a collection of art works and sculptures for viewing but not for sale. GETTING THERE - MTR Tsim Sha Tsui Station exits D1, D2 or M2. MTR East Tsim Sha Tsui Station exits N1 or N2. 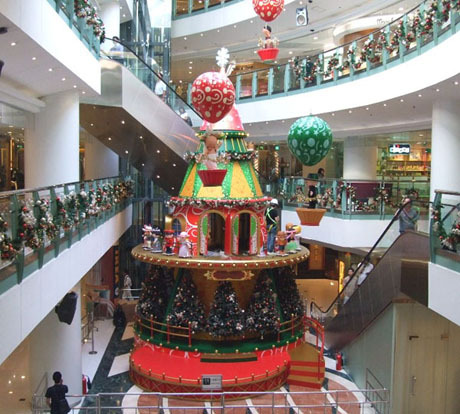 The mall is about ten minutes walk from Star Ferry Pier, Tsim Sha Tsui and Star Ferry Bus Terminus. 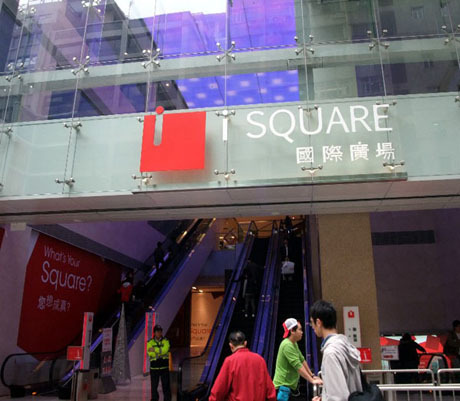 iSQUARE, opened 16th December 2009 was developed by Associated International Hotels Limited and is a distinctive major 31-storey vertical “boutique mall” with twelve-storey podium, cinema box and tower. The mall features mid to high end retail stores including designer fashion, lifestyle and beauty shops, watches and jewellery, audio-visual, restaurants and on the seventh-floor 1000-seat IMAX cinemas including a 3-D theatre. Unlike most vertical malls the design of iSQUARE gives it a light, airy and spacious feel and the mall’s towering glass curtain walls allow panoramic views over Kowloon. Some floors are linked by express lifts missing out intermediate floors. Not all units are yet occupied and shops currently open include Crocodile, Ice Fire, Lacoste, Bossinistyle, Moiselle, Bess, Tshirt Store, Byford, Wenger, Bruuns Bazzar, Futbol Trend, Diane Freis, Lenscrafters, City Chain, Clarks, Mango, Tissot, MaBelle, Seiko Boutique, Chow Tai Fook, Isabella and G-TOX Concept Store. Broadway, Bose, Ninki Denki, New Balance, Rouge Amour, Sabatina and Diane Freis. On Lower Ground Floor is a Marketplace by Jasons supermarket. Restaurants including fine dining include Ambrosia Oyster Bar & Grill, Golden Palace Seaview Banquet Hall, Jiang Shun Fresh Water Seafood, Star of Canton, Chao Yang, Myung Ga Korean Restaurant, Sushi Nagoyaka Tei, Romankan Yokohama, Café Key West, Gyu Jin Shabushabu & Sukiyaki and Budaoweng Hotpot Cuisine. OPENING HOURS - Individual shop opening hours vary from about 10/11am to 9pm/10pm. Supermarket open 9am to 11pm daily. IMAX cinema open from about 10am until midnight. GETTING THERE - MTR Tsim Sha Tsui exits R and H lead directly to into the mall at lower basement level. Exits C1 and C2 are on Nathan Road outside the mall at ground floor level. Numerous bus routes stop on Nathan Road at Tsim Sha Tsui Station close to the mall including KMB services 1,2,13X,6,6A,7,9,13X,41A,224X,268B and 269B. 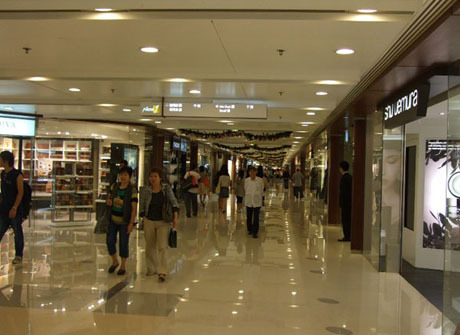 The mall is about ten minutes walk from Star Ferry Pier, Tsim Sha Tsui. 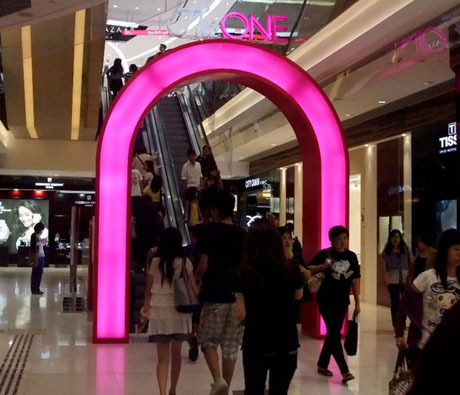 The One, developed by Chinese Estates Holdings, opened in July 2010 and is a 29-storey retail shopping mall and entertainment centre. It is located on Nathan Road in a busy tourist district adjacent to The Mira hotel and close to other major hotels. Most of the retailers are “mid-range” although a Harvey Nichols Beauty Bazaar personal care store opened in 2011. There are about 200 shops and tenants include Adidas, Anna Sui, Bauhaus, BSX, Camper, Columbia, French Connection, Izzue, Optical 88, Rado, Rockport, Puma, Timberland and Tissot. There are a number of home furnishing stores including Avant Garde, Casablanca, Rapee Living and Simmons. “High-end” restaurants with views occupy levels 17 to 21 including Miyabi, Star of Canton, Teppanyaki Kaika, Harlan’s and Wooloomooloo Steakhouse. Café Deco, which has been located in the Peak Galleria at The Peak for 22 years is to close at that location towards the end of July 2016 and will relocate to the 20th floor of The One in September 2016.Café’s on other floors include Caffe Vergnano, Sprout, Pacific Coffee and Caffe Habitu. There is a California Fitness gym with Jackie Chan Sport Club on Levels 9 and 10 and a six –screen Broadway Cinema occupies Levels 6 to 11. OPENING HOURS - Individual shop opening hours vary from opening times of 10am to noon and closing times of 8pm to 10pm. Most restaurants open late. Broadway Cinema open about 11am until midnight. California Fitness open 6am to midnight (8am to midnight Sundays and public holidays). GETTING THERE - MTR Tsim Sha Tsui Station exit B1 or B2 and walk north up Nathan Road for about 150 metres. Numerous bus routes stop on Nathan Road at Tsim Sha Tsui Station close to the mall including KMB services 1,2,13X,6,6A,7,9,13X,41A,224X,268B and 269B. Developed and owned by MTR Corporation Elements is a mostly upmarket mall which opened in October 2007 above Kowloon Station in a newly developed office, hotel, retail and residential complex which includes Hong Kong’s tallest building, the 118-storey International Commerce Centre (ICC). 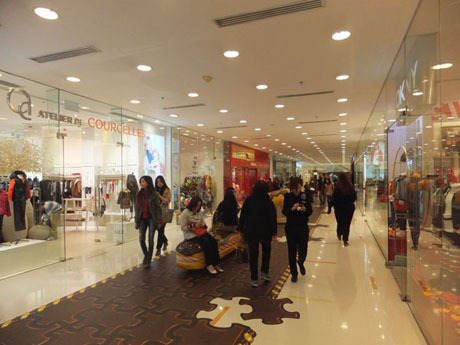 There are about 150 shops, many of which sell luxury brands, over 20 café’s and Asian and Western restaurants, an ice rink, cinema and the mall also houses a coach terminus for cross-border services to mainland China. The mall is divided into zones on four levels representing the five Chinese elements of metal (luxury), wood (health & wellbeing), water (food & beverage), fire (entertainment) and earth (fashion). Stores include Anna Klein New York, Brooks Brothers, Fendi, DAKS, Diesel, Dunhill, Gucci, H&M, Prada, Vivienne Tam, Vivienne Westwood, Cartier, Montblanc, Calvin Klein, Zara, Coach, Escada, Kate Spade, Shanghai Tang, Tiffany & Co, HMV, Bose, Callaway, Fila and Nautica. Threesixty on Level 1 is a large organic food supermarket and at roof level there is an aromatic garden, playground and kindergarten. Restaurants include Sala Thai, Pak Loh Chiu Chow Restaurant, Megu Modern Japanese Restaurant, Lei Garden, Husk Thai & Vietnamese Cuisine and Wooloomooloo Steakhouse. The 1200 seat capacity Grand Cinema on level 2 has twelve screens and is equipped with an Infrasonic system with specially designed “shaking” chairs. Grand Cinema is to close at the end of February 2019 - it is not known at this stage whether it will continue under a new operator at a future date. See Elements website for up to date information. 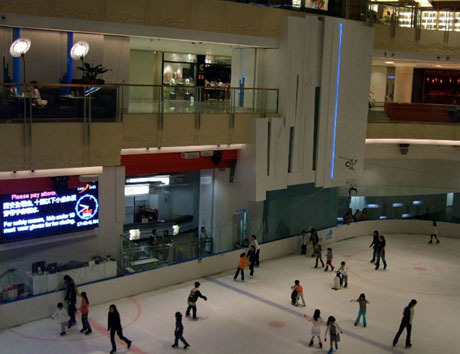 The Rink ice rink on the ground floor is an open-rink with no ticket booth or fixed time sessions. Instead skaters use Octopus Card to pay by the minute. There are ringside seats and a viewing balcony. The ticket office and waiting lounge for China Coach Terminus is located at level 1 and there are daily half-hourly express coach services from 6-15am to 7-15pm to Shenzen International Airport via Shenzhen Bay Bridge. For floor plan and full directory of shops and café/restaurants see the Elements website. OPENING HOURS – See Elements website for details of individual shop /restaurant/café opening hours (shops mostly open 10am to 10pm daily). Supermarket 8am to 10 pm daily. *Cinema 10am to 10pm daily. 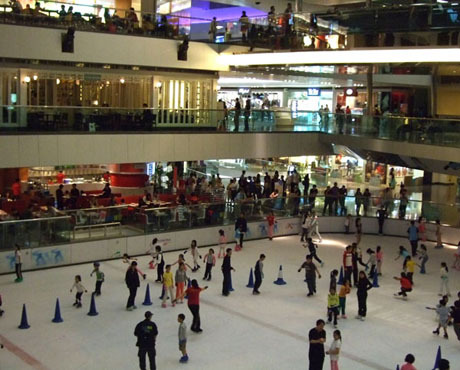 Ice Rink 10am to 10pm daily. * Cinema closing at the end of February 2019. It is not known at this stage whether this will be taken over by a new operator. Check Elements website for up to date information. GETTING THERE – MTR Kowloon Station (Airport Express and Tung Chung Lines). Escalators from the platform lead directly to the mall which is above the station. BUS – routes 8,11,215X,203E and 270A serve Kowloon Station Bus Terminus adjacent to the station and mall. Routes 36B,42A,46,60X,63X,68X,69X,81,95,110 and 296D serve Jordan (Wui Cheung Road) Bus Terminus which is about 5 minutes walk from Elements. FREE SHUTTLE BUS – from outside DFS (Duty Free Shoppers) store on Peking Road (near Canton Road junction) every 20 minutes from 12-30pm to 9-30pm daily. Located in the heart of one of Kowloon’s busiest districts Langham Place is a 15-storey “vertical” shopping mall, supermarket, cinema, 665-room five-star hotel and 60-storey office development. The complex was opened in late 2004 and originally owned by Great Eagle Developments but in 2008 the shopping mall and office tower were purchased by Champion REIT with Great Eagle retaining ownership of the hotel. 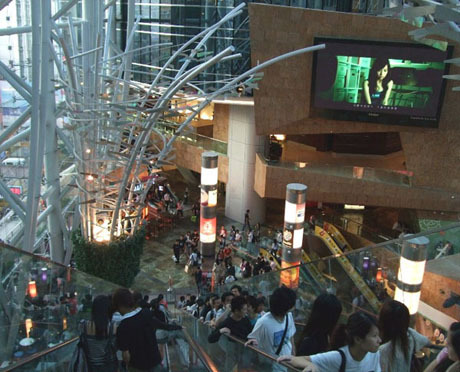 Major features of the shopping mall are the huge glass Grand Atrium with giant video screen, a bronze “stick-man” sculpture known as “Happy Man” and Hong Kong’s longest indoor escalators “Xpresscalators” directly connecting levels 4 and 12 and “Digital Sky” in which computer generated images are projected onto the ceiling above the level 13 dining area and “Spiral Stars Gallery” with mainly young fashion shops on levels 8 to 13. There are over 160 retail shops offering fashion, sportswear, accessories, shoes and bags, jewellery and watches, beauty and skincare products, personal and healthcare, audio/visual, electronics and telecommunications, music, toys and gifts. The flagship store is HK Seibu Department Store on levels 1 and 2 and other major stores include H&M, Muji, AIX Armani Exchange, Calvin Klein, French Connection, IT, Levi’s, Bauhaus, Adidas, Columbia Sportswear, Marathon Sports, Isabella, Millie’s, Staccato, MaBelle, Tissot, Aveda, Giffarine & Pattrena, L’Oreal Paris, Maybelline New York, Genesis, Snoopy and CD Warehouse. At Basement 2 level is Market Place by Jasons Supermarket. There are over 45 food outlets including in “The Ozone” dining area on level 13 Mr Steak Café, Kaleidoscope, Simply Thai and Tapaz. Other café’s/restaurants include Ajisen Ramen, Genki Sushi, Euro Go Go, Guangzhou garden, Korea House, Saint’s Alp Teahouse, Starbucks and Shang Shang Shanghai Cuisine. In the office tower at levels 6 to 9 are Pure Fitness and Pure Yoga Suites. The six-screen multiplex UA Cinema is on level 8. For directory of shops and food outlets see the Langham Place website. OPENING HOURS – The shopping mall is open from 11am to 11pm daily. Opening hours of shops varies but mainly 11am to 10pm/11pm. Café’s/Restaurants open various hours. See website. GETTING THERE – MTR Mongkok Station (Tsuen Wan Line & Kwun Tong Line). Exit C3 leads directly to Langham Place Basement 2 level. Also exits C4 (Argyle Street) and E1 (Nelson Street) are within two minutes walk of Langham Place. MTR Mongkok East Station (East Rail Line) – from exits C and B there is an elevated pedestrian walkway to Nathan Road and Langham Place (about 10/15 minutes walk). BUS – All buses travelling on Nathan Road through Mongkok stop outside entrance to Mongkok Station within about three minutes walk from Langham Place. Routes include 1, 1A, 2, 3C, 6, 6A, 6C, 9, 41A, 95, 102, 104, 112, 117, 118, 171, 203, 212, 234X, 238X, 281A, 970, 970X, A21. 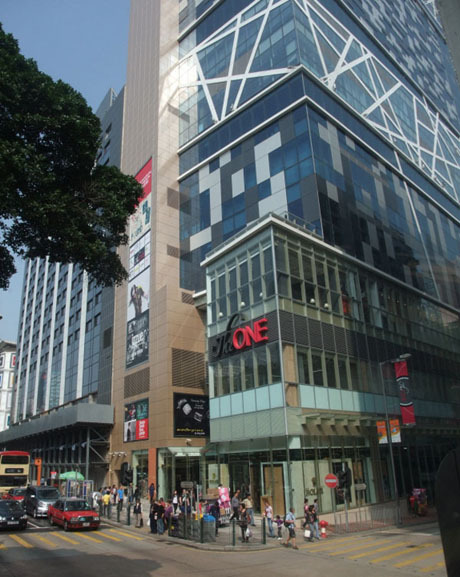 Located immediately adjacent to Mongkok East Station on MTR East Rail line and Royal Plaza Hotel, this seven-storey mall, previously known as Grand Century Place, and owned by Sun Hung Kai Properties was completely renovated between 2013 and 2015 and renamed MOKO. At early 2015 some units were still undergoing refurbishment and vacant. It has a floor area of 720,000 sq ft with about 170 shops, about 16 restaurants and cafes and food court mainly arranged in a circular layout around a central atrium. The mall also has an eight-screen cinema and karaoke box. A 12,000 sq ft YATA "express" Japanese supermarket is located on Level 3 along with a range of childrens fashion shops which include Chickeeduck, Hallmark Babies, Mothercare, Nike Kids and Toonsland. Fashion stores mainly located on Levels 1 & 2 include Chocoolate, Bossini, Mango, Tommy Hilfiger, G2000, Calvin Klein Jeans, French Connection, Uniqlo, Vivienne Westwood and Superdry. Footwear and accessories shops include Dr Martens, ecco, Hunter, UGG Australia, Timberland, Fossil and Le Saunda. Jewellery shops include Tissot, Chow Tai Fook, Folli Follie, City Chain, Tous and Links of London. Sports shops are located on Level 4 and include Converse, Adidas, Nike, New Balance, Le Coq Sportif and New Balance. Beauty and personal care shops include Clinique, L'Occitane, The Body Shop, Mannings, Fancl, Aveda, Clarins and Wah Fung Medicine. Electrical and technology shops are located at Level 4 and include Fortress and Bose. Asian dining options include Peking Garden Restaurant, Super Star Seafood Restaurant, Jade Garden, Shanghai Min, Western dining outlets include Oliver's Super Sandwiches, Pizza Express, Pacific Coffee and Urban - Cafe Commune. Food Opera food court is located on Level 3. 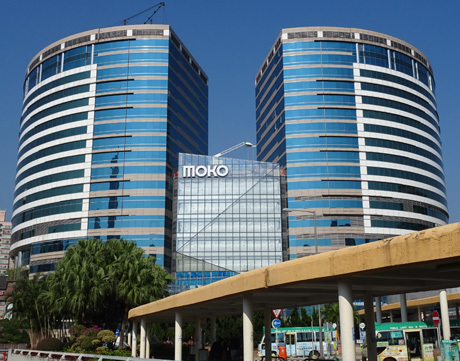 UA Cinema Moko is at Level 4 and New Karaoke Box at Level 5. OPENING HOURS – Opening hours of shops vary but are mainly from about 10am to 11am with closing times of between 8pm and 10pm. YATA supermarket opens from 10am to 10pm. Cafe and restaurants opening hours vary from between 8am and noon until 10pm to about midnight. UA MOKO Cinema opens from about 11am until midnight, occasionally with later showings from midnight. Neway Karaoke Box opens 10-30am until 5-30am. 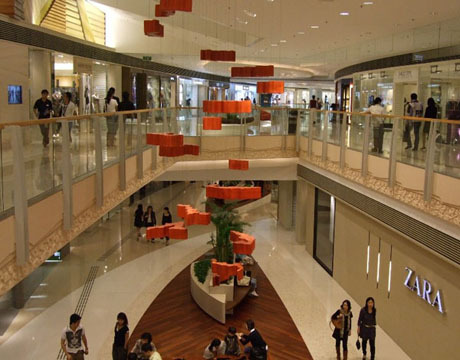 GETTING THERE – The mall is located adjacent MTR (East Rail) Mongkok East Station (exit D). Other MTR stations nearby are Mongkok (Tsuen Wan Line and Kwun Tong Line), exit B3 from where there is an elevated pedestrian walkway link to Mongkok East Station and MOKO (about 8 mins walk) and Prince Edward (Kwun Tong Line) exit B2, (about 10 mins walk). Frequent bus services operate along both Prince Edward Road West (adjacent to the mall) and Nathan Road, about 10 mins walk from the mall including 1,1A and 2C from Star Ferry Pier Bus Terminus, Tsim Sha Tsui. Buses 12, 12A, 12B, 21K, 79K all serve Mongkok East Station Bus Terminus alongside MOKO. 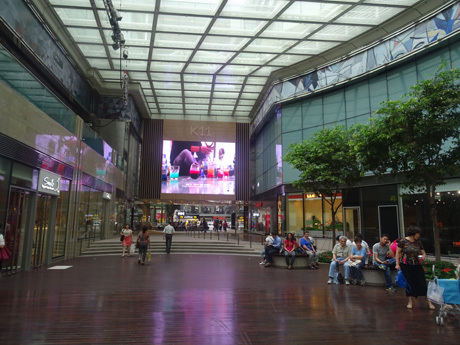 Festival Walk which opened in 1998 is a large and attractive mall owned and managed by Swire Properties who were a partner in development of the mall. It is located above a major rail interchange and has an excellent range of about 200 mostly mid to up-market shops, café’s and restaurants, supermarket, cinema and ice rink. A sky lit atrium and attractive decor makes this hugely popular mall a bright, airy and pleasant place for both shopping and entertainment. There are six levels of retail shops offering ladies, men’s and children’s fashion, casual wear, sports wear and equipment, jewellery and watches, accessories, toys, beauty and personal care, books and gifts, furniture and house wares, audio/visual and electrical appliances. On 29th September 2012, Festival Walk became home to Hong Kong's second Apple Store, a year after the city's first Apple Store opened in IFC Mall. Other major stores include Marks & Spencer, H & M, LOG-ON, Page One Bookstore, Toys’R Us, Royal Sporting House, Esprit, Fortress, Broadway, Hong Kong Records, Christian Dior, Clinique, Estee Lauder, Swarovski, Calvin Klein, Escada, Mango, Vivienne Tam, Vivienne Westwood, Fila, Levi’s, Coach, Bang & Olufsen, MaBelle, Adidas, Marathon Sports and DKNY. There is a large Taste Supermarket at MTR level and level 2 has a large FoodFest food court with a variety of fast-food outlets including KFC, McDonalds, Noodle Place, Patong Thai and Yoshinoya. There is also a good selection of coffee bars, café’s and Asian and Western restaurants on other levels including Pacific Coffee, Starbucks, Oliver’s Super Sandwiches, Amaroni’s Little Italy, Dan Ryans Chicago Grill, The Spaghetti House, Festive China, House of Canton, Ichikawa, Red Lily and Sesson Kushiyaki. The eleven-screen multiplex AMC Cinema is at upper ground level and Glacier Ice Rink on upper ground level is Hong Kong’s largest and has theatrical lighting, plasma TV screens and high-quality audio system. There is a skate shop Inside Edge attached to the rink selling skates and equipment and restaurant EXP. There is ringside seating and there are viewing balconies around the FoodFest food court above. For shops directory and floor plan see Festival Walk website. OPENING HOURS – The mall is open from 7am to midnight daily. Opening hours of shops varies but mainly 10am/11am to 9pm/10pm daily. Ice Rink open 10-30am to 10pm Monday and to Friday (8pm close on Tuesdays), 8-30am to 10pm Saturday, 1pm to 5-30pm Sunday. Cinema from about 9-30am to midnight daily. Taste Supermarket 10am to 10pm daily. GETTING THERE – MTR East Rail (formerly KCR) Line Kowloon Tong Station and MTR Kwun Tong Line Kowloon Tong Station (interchange stations). Exits C1 and C2 lead directly into Festival Walk. BUS – Routes 2C, 80M, 81M, 82M, 88M, 203, 796B to Festival Walk/Kowloon Tong Station Bus Terminus. Also bus routes 3C, 7, 72X, 81C, 87D, 103, 170, 182, 270A, 271 and 281A stop on Waterloo Road near Suffolk Road from where it is about 5 minutes walk to Festival Walk (disembark from the bus at the stop displayed inside the bus as “Kowloon Tong Railway Station”). 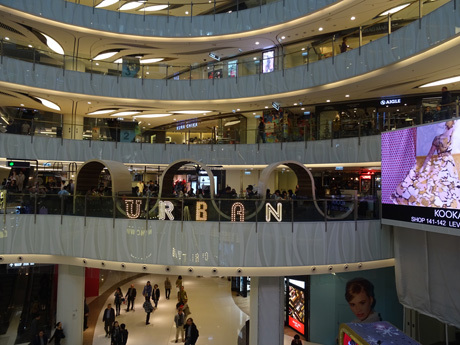 Owned by Sino Group Olympian City comprises three separate shopping malls including supermarket, cinema and bowling alley on either side of Olympic Station in West Kowloon and connected by covered elevated walkways. Olympian City 1 (200,000 sq ft) opened in June 2000, the much larger Olympian City 2 (600,000 sq ft) opened in November 2001 and Olympian City 3, connected by bridge to Olympian City 2, opened in 2011. The malls and the station are named in tribute to Lee Lai Shan who won Hong Kong’s first ever gold medal in the Olympic windsurfing event in 1996 and also two paralympic athletes won gold medals for Hong Kong in the same year. There are two shopping levels in Olympian City 1 and 3 and three levels in Olympian City 2. 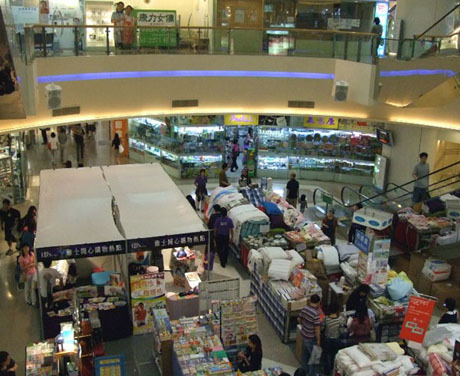 Olympian City 1 has only about 30 outlets being mainly beauty and healthcare shops and spa centres, lifestyle and gift shops and a number of music and learning centres but an indoor market is often held with a number of bargain clothes stalls. Shops include Slim Beauty, i-Beauty Spa, Classy Salon, Seewan Beauty, Action Waterfall sports and equipment, Japan Home Centre, Cadenza Music Institute, Wise Studio, Wu Yeung Fine Art Academy and Greenery Music. There are eight café’s/restaurants including Café de Coral, King Palace Chinese Restaurant, Roda Japanese Restaurant and Shark’s Fin City. Olympian City 2 has about 180 shops offering fashion and accessories, audio/visual and electrical appliances, lifestyle and gift products, leather goods, shoes and bags, jewellery and watches, children’s wear and toys and sports wear and equipment. 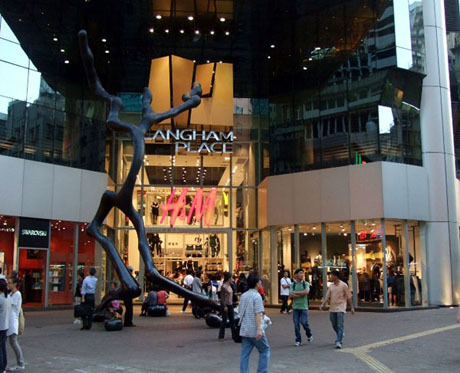 Its flagship store is Marks & Spencer and shops include FANCL House, Lenscrafters, Pretty House Beauty and Spa Centre, Bauhaus, Bossini, G2000, Giordano, Levi’s Outlet, Dr Kong Footware, Mirabell, Skechers, Chow Tai Fook, City Chain, Marathon Sports, Royal Sporting House and Slazenger. There is a Food Republic food court on ground level with 14 Asian fast-food outlets and around 25 further café’s/restaurants including McDonald’s, KFC, Federal Restaurant, Genki Sushi, Modern China Restaurant, Pizza Hut and Saint’s Alp Teahouse. There is a large Taste Supermarket on ground floor level. Level 1 houses both the six-screen multiplex Broadway Cinema and Olympian City 22-lane Super Fun Bowl which offers disco bowling amongst its activities and the ground level has a Jumpin’ Gym USA. Outside the Cherry Street entrance is a piazza area with open-air dining. Olympian City 3 has about 70 shops and "Food Garden" with fast food outlets. OPENING HOURS – 10am to 10pm daily but some shop and café/restaurant hours may differ. See website for opening hours of individual outlets. Supermarket open 8am to 11pm daily. Cinema open 12 noon to midnight Monday to Friday, 10am to midnight Saturday, Sunday and public holidays. Bowling alley open 10am to 1am Sunday to Friday, 10am to 2am Saturday. GETTING THERE – MTR Olympic Station (Tung Chung Line) exit A for Olympian City 1, exit D for Olympian City 2 & 3. The malls are linked by elevated pedestrian walkway. BUS – Routes 13D, 43C, 87B, E21 to Olympian City 1 Bus Terminus. Routes 31B, 32, 37, 66X to HSBC Centre Bus Terminus (connected by elevated walkway to Olympian City), routes 904 and 905 stop on Cherry Street outside Olympian City 2, routes 16, 33A, 72X, 87A, 265B to Park Avenue Bus Terminus two minutes walk from Olympian City 2. Developed and owned by Kerry Properties MegaBox opened in June 2007 in the Enterprise Square redevelopment area of east Kowloon overlooking Kowloon Bay and the old Kai Tak Airport runway. The bright red exterior of this large “vertical mall” makes this prominent building easily visible from across the harbour on Hong Kong Island. There are 18 floors (including two floors housing a car park) with about 180 shops, café’s, restaurants and supermarket in this warehouse-type building. The mall has over 1000 parking spaces and is intended to attract locals who wish to park and shop and although the mall is not on most tourists list of places to shop it does include an IMAX cinema, ice rink and two cockpit-size Boeing 737 flight simulators. Ground level and levels 1 and 2 house mainly mid-range fashion and accessories shops although there are few familiar names. Major shops include a large Novo store, Extravaganza, Femme Boutique, FX Creations, Enigma and Consignment. Levels 3 to 5 are mainly dedicated to home improvement. Swedish furniture, homeware and accessories group IKEA opened their third Hong Kong store on Levels 3 & 4 in June 2010, replacing British DIY supermarket B & Q who closed their Megabox store, the only B & Q in Hong Kong, following the company's decision to pull out of China altogether. Spotlight, the Australian home improvement chain also pulled out of Megabox in 2009. Other home improvement shops include I Love Kitchen, Hunter Douglas Window Fashions Gallery, Aussino, J.M Soft, Simmins, Sinomax and Osim. Levels 6 to 9 are a Family and Lifestyle Zone with children wear and toys, sports wear, supermarket, café’s and restaurants. Shops include Mothercare, Chickeeduck, Harvest Toys and Little First Store. Wellcome Supermarket occupies most of level 7. Levels 10 to 14 are the Restaurants and Entertainment Zone with Mega Ice international size ice rink on level 10 which has panoramic glass windows with harbour views, UA MegaBox Cinema and Theatre on level 11 has 7 screens plus a five-storey high IMAX screen where 3-D movies are shown. There are over 20 restaurants in this zone offering a wide variety of mostly Asian cuisine including Hachiban Ramen, Meguro Sushi, Taste of Singapore, Hang Heung’s Kitchen, The China House and Paramount Banquet Hall. Level 18 is taken up entirely by California Fitness suite. On the ground floor Flight Experience Hong Kong offers the opportunity to pilot a Boeing 737 simulator under the supervision of qualified commercial pilots. Floors are linked by escalators and levels 1 and 5, 5 and 8 and 8 and 10 are directly linked by express escalators. 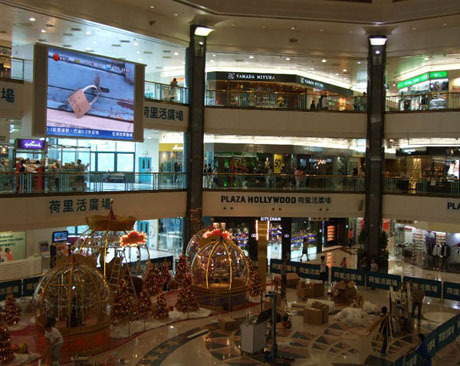 Megabox is a short distance from another of Kowloon’s large shopping malls Telford Plaza (see below). OPENING HOURS – Shops mostly open 10am or 10-30am to 9-30pm or 10pm. See website for details of individual shop/café/restaurant opening hours where available. Wellcome Supermarket 9am to 10pm daily. Ice Rink 10am to 10-30pm Monday to Friday, 9-30am to 10pm Saturday, 9am to 11pm Sunday (closes to public for skating at 8-30pm Monday to Thursday and 7-30pm Sundays for ice hockey league matches and practice). Cinema from about 9am to midnight daily. (i) free shuttle coach service (take station exit A follow the ground floor of Telford Plaza 1 to escalators, take escalators up to Telford Boulevard then at Circle K store follow mall on the left to Telford Plaza 2 and take escalator or steps down to taxi stand/green minibus terminus/shuttle bus stop). (ii) walk (about 10/15 mins - see above route and instead of turning left at Circle K carry straight forward to end of Telford Boulevard to footbridge. At footbridge go to street level Wai Yip Street and from opposite side follow Sheung Yeut Road past Chevalier Centre and Oriental News Building to Wang Chiu Road. 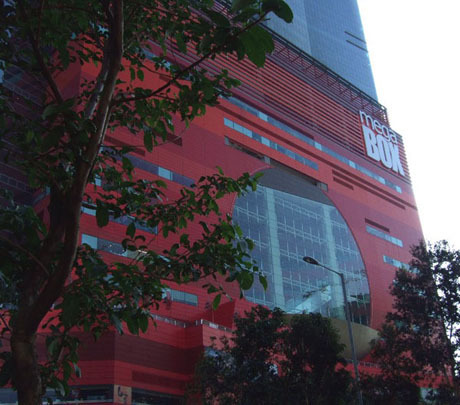 Megabox is a short distance to the left along Wang Chiu Road. BUS – Route 15A,297,606 and 641 all pass Megabox on either Wang Chiu Road or Sheung Yee Road. Telford Plaza located next to the large private Telford Garden residential estate is owned by MTR Properties and in addition to being a shopping mall and entertainment complex is home to the headquarters of MTR Corporation and linked to MTR Kowloon Bay Station. The development has been conducted in two phases with Telford Plaza 2 being the newer and larger mall and Telford Plaza 1 having undergone a recent major refurbishment. There are over 200 shops arranged along “themed boulevards”, department store, furniture supermarket, café’s, restaurants and cinema. 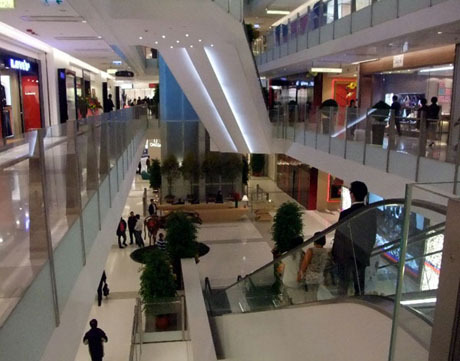 Plaza 1 mall is on two levels whilst Plaza 2 has four floors of shops. At Podium Level a Garden Plaza with fountains and small park links the two phases. There is a wide variety of mostly mid-range outlets selling fashion and accessories, sports wear and sports equipment, children’s wear, optical goods, health & beauty products, watches and jewellery, music and video, computer, electrical, audio-visual and telecommunications products, home furnishing and household goods. Major stores are Marks & Spencer Department Store in plaza 1 ground floor and a large IKEA furniture store in plaza 2 levels 3,4 and 5 and Jason’s Marketplace Supermarket at Podium Level. Other shops include Bauhaus, Ecco, Esprit, FX Creations, Giordano, G2000, Levi’s, Mirabell, Walker Shop, Crabtree & Evelyn, Clinique, Fancl, Lancome, The Body Shop, Marathon Sports, Chickeeduck, Chow Tai Fook, City Chain, Broadway, Fortress World, HMV and Tom Lee Music. There are over 20 food outlets in plaza 1 and over 12 in plaza 2 including Genki Sushi, Jade Garden, Lei Garden, KFC, Maxim’s Palace, McDonald’s, Pizza Hut, Café de Coral, Iccho Japanese Restaurant, King Palace Chinese Restaurant and The Spaghetti House. There is a Jumpin’ Gym USA in plaza 2 and UA Telford 5-screen multiplex cinema is a recent addition to plaza 1. OPENING HOURS – Most shops open from 10am/10-30am/11am until 9pm/10pm daily. Check website for opening hours of individual shops. Marks & Spencer 10-30am to 10pm daily, IKEA 10-30am to 10-30pm daily, Jason’s Marketplace Supermarket 7am to 11pm daily. GETTING THERE – MTR Kowloon Bay Station exit A. BUS – There are numerous bus routes which pass Kowloon Bay MTR Station on Kwun Tong Road including 1A, 3D, 11B, 14, 15, 16, 17, 38, 40, 42C, 62X, 70X, 74A, 74X, 80, 80X, 83X, 89B, 89C, 89D, 89X, 93K, 258D, 259D, 268C, 269C, 277X, 296C, 671, 796B, A22, E22, E22A. Situated in a prominent location in north-east Kowloon close to the entrance to Tate’s Cairn Tunnel Plaza Hollywood is owned by The Wharf Holdings who also own Times Square and Harbour City. 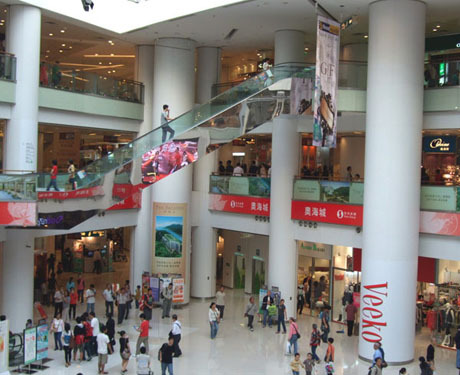 The mall which is directly above Diamond Hill MTR Station has around 170 shops, department store, supermarket and about 20 food outlets on four levels around a large central atrium with giant video screen and also houses a cinema. The mall’s “anchor store” is Marks & Spencer Department Store on level 1 and there is a large Park’N Shop Supermarket on level 2. A wide variety of mostly mid-range shops offer fashion, stationery, books and gifts, health, beauty and pharmacy products, toys and hobbies, jewellery and watches, audio/visual and electrical appliances, children’s wear, art, home furnishings, sports wear and equipment, music, leather goods and shoes and telecommunications products. Shops include Arnold Palmer, Bauhaus, Baleno, Bossini, Giordano, G2000, Levi’s, IP Zone, Samuel & Kevin, Snoopy, Crabtree & Evelyn, Fancl House, Ingrid Millet Paris, O’Berry Australian Products, The Body Shop, Yves Rocher France, Chow Sang Sang Jewellery, City Chain, MaBelle, CD Warehouse, Broadway, CMK Electrical Store, Fortress, Gome, Hang Cheong Furniture, Jade Rattan Ware, Adidas, Columbia, Marathon Sports, Royal Sporting House, Dr Kong, FX Creations, Maud Frizon Paris, Staccato and Walker Shop. Cafes/restaurants include Double Star Café, Hachiban Ramen, KFC, McDonald’s, Pizza Hut, Saint’s Alp Teahouse, Thai House and Wansu Korean Kitchen. There is a Jumpin’ Gym USA on ground level and Golden Harvest’s six-screen multiplex GH Hollywood cinema is on level 4. The atrium is often a venue for prestigious exhibitions. OPENING HOURS – Most shops open from 10am/10-30am/11am to 9-30pm/10pm/10-30pm. Marks & Spencer Department Store 11am to 10pm Monday to Thursday, 11am to 10-30pm Friday to Sunday. Park’N Shop Supermarket open 8am to 11pm daily, GH Hollywood Cinema from about 11am to midnight daily. Check website store directory for individual shop/food outlet opening hours where available. GETTING THERE – MTR Diamond Hill Station exits C leads to ground level of Plaza Hollywood via escalators next to bus station. BUS – Routes 11, 91, 91M, 92, 286M and 671 serve Diamond Hill Station Bus Terminus. Routes 38, 80, 89, 796B E22 and E22A stop on Lung Cheung Road outside Diamond Hill MTR Station. Routes 3B and 10 stop on Fung Tak Road close to Plaza Hollywood.